EXACT LOCATION: Car park at end of Karapoti Road. Take the main SH2 road through the top end of Upper Hutt and turn left into Akatarawa Rd. Travel about 5km along this road to Karapoti Rd. Turn left into Karapoti Rd and continue all the way to the end of the road. DEFINING CHARACTERISTICS: Mostly 4WD road with loose stones (sharp, not smooth). Lots of big puddles most of the year. FEATURES OF INTEREST: Location of old logging tramway, although all historical remains have gone. 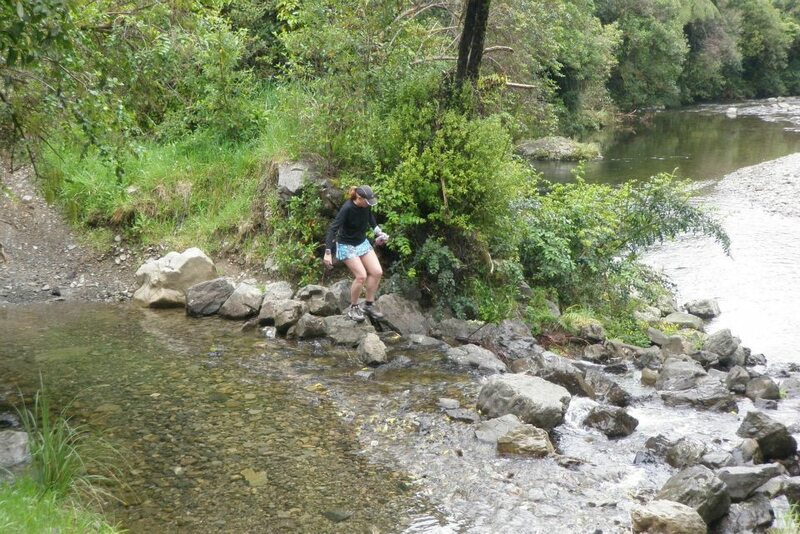 Runs beside the crystal-clear Akatarawa River, primarily through native bush. Waterfall on other side of the Gorge about half way along. RUN IT: Start from the car park and run in about 1km to the first river crossing. A side-track to the right goes up to the site of an old bach, now just 2 chimneys remaining. To cross this waterway you have two options: either through the water, or walk across a single remaining beam from the old bridge. The track winds its way up through the Gorge, slowly gaining height above the river. The roar of water will announce a waterfall on the far side of the Gorge. A short distance on from here there is a good view back down the Gorge where you can appreciate how far you have climbed. Continue on for perhaps another 2km to McGhies Bridge. There’s several options from here, but for the Gorge run return to the car park.